Finding the right design and style for your bathroom is always tough. Do you stick with plain old white, a more aqua colour, or something completely out there? If you are looking to keep thing sensible yet attractive, then we have the perfect solution for you. 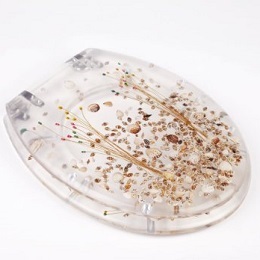 This sea grass toilet seat has a lovely design on it to match the simplest or the most complex bathroom design. Whether you have tried to match something more muted or you want people relieving themselves in a dramatic and inviting environment, this acts as the perfect solution. The embedded design is of the highest quality, and the seat is made to last for many, many years. Give yourself quality and durability all in the one purchase today with this brilliant toilet seat.